Natural stone tile floors are beautiful, long-lasting, and are an important component of property value consideration. Keeping them in new or near-new condition requires a bit of maintenance, but this infrequent procedure is vital. Natural stone tiles are subject to wear and tear, mainly from foot traffic and the presence of contaminants in water. Although granite, marble, or travertine tiles are usually honed or polished prior to installation, periodic upkeep is necessary in order for the stone to maintain its elegant appearance. Stonexchange is a manufacturer and importer of natural stone products made from granite, marble, and travertine. Because we own the product from the time raw material is taken from quarries, it is in our best interest to inform our clients on proper maintenance procedures. Our company has developed some very efficient polishing and cleaning products that will greatly extend the usable life of the tile. Whenever natural stone is used as a surfacing material, long-term cost estimates must be figured in to the equation. The end-user, whether it be a property management company or an individual homeowner, always wants to know how much the material is going to cost them in the long run. This is no different than buying a car. Some models have excellent value retention, and smart buyers make this a priority when choosing what to purchase. Most types of rock are slightly water absorbent. They certainly don’t look that way, but it is true. For example, both granite and marble are composed of restructured crystalline compounds. Granite is a combination of quartz and biotite, and the resonance structure of the molecules makes for a specific alignment of the crystals. Tiny inclusions exist that allows moisture to penetrate the surface. Most granite is not affected by this moisture intrusion because the rock is found far underground. The water table shifts away from a geologic formation of granite because it finds an easier downhill path toward a looser rock layer. However, once granite is extracted, cut into tiles, and placed on a floor surface, water can now easily leech its way into the material. Travertine is also somewhat porous. However, this material can be honed and filled, sealed with a specialty coating, and made very water-resistant. Most travertine suppliers specify different grades of material based on how well the stone will stand up to heavy foot traffic as well as humidity, especially humid air that contains contaminant compounds. Moisture intrusion will eventually cause the color of marble or travertine to fade. The reflectivity of the stone will also be affected to some degree. It is therefore vitally important to give these tile surfaces a periodic cleaning and polishing. The choice of cleaning products should be made only after studying the active ingredients found in them. Some manufacturers produce brands that are generalized in their formation and may contain chemicals that react negatively with certain compounds present in the stone tiles. Stonexchange and Nalboor Tiles have developed a line of cleaning products and polishing compounds that are designed specifically for use with granite, marble, or travertine tile surfaces. Both granite and marble have certain chemical compounds present in the stone. It is the reaction between these compounds and the chemicals found in the polish that produces the beautiful shine and makes natural stone such a conversation piece. It is very important to use only those polishing products that are manufactured specifically for granite and marble. When stone tiles are cut and shaped, they are put through a grinder to give them a flat surface and straight edges. The tiles are then given their initial polish. This is accomplished by coating the stone with the polishing agent and then rubbing in the polish using water and an industrial hair pad. The polish is forced approximately one millimeter into the stone. The polish becomes a slurry and reacts with the calcium carbonate present in the rock. The result is a highly reflective surface, one that is also much smoother than before and slightly more resistant to scuffing. Environmental effects will slowly cause the shine to diminish. This is in part due to the wear and tear experienced as foot traffic comes in contact with the stone. Most people are not aware that a typical marble tile will lose up to one millimeter of thickness after several years of exposure to moisture and foot traffic. For this reason, periodic maintenance that includes polishing is necessary. The procedure is not difficult and can be undertaken either by the property owner or a contracted cleaning professional. Subsequent polishing procedures on granite or marble surfaces will ensure that scratch damage is kept to a minimum while at the same time keeping the surface shiny and beautiful. Stone tiles tend to attract dirt and soot. Even though the surface of the rock is smooth, small particulates stick readily because of the natural friction between rock and grime. The presence of moisture is also a concern because water can contain harmful contaminants. Granite and marble should be wiped down periodically with a damp cloth or mop. Dust should not be allowed to accumulate because any disturbance such as foot traffic will cause tiny scratches. Although granite and marble are very hard and resistant to cracking, scratching will occur if the contaminant particles are of certain chemical composition. Travertine is susceptible to moisture intrusion even if it has been honed and filled. This material is popular for use as a kitchen backsplash or as a shower stall surface covering. It must be sealed to prevent the percolation of moisture. Otherwise, travertine will slowly discolor and become faded. 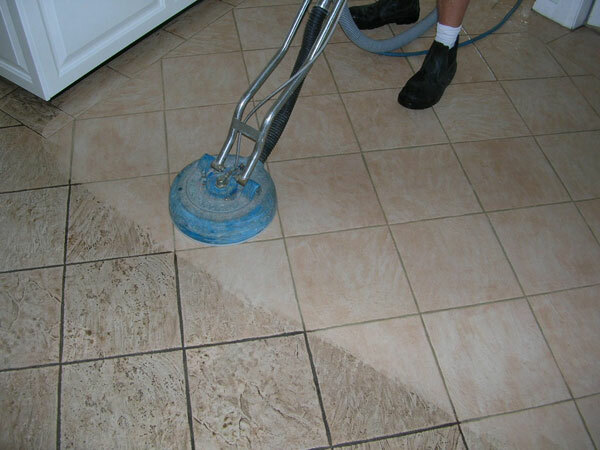 Specific cleaning solutions have been developed for each type of natural stone tile. The differences in the rock structure and the compounds that makeup the stone require this. The quartz present in granite will react quite differently with cleaning solutions that have been specifically developed for use with ceramic, for example. Stonexchange has developed a line of cleaning products designed for use with each type of natural stone materials we manufacture and distribute. These products have been thoroughly tested not only for effectiveness but also for compatibility to a certain type of stone tile. Our company recommends using these products on our floor tiles, transition thresholds, window sills, shower curbs, and soap shelves. Nalboor Tiles is the online shopping page for all floor tiles manufactured, imported, and distributed by Stonexchange. Most of our customers are flooring companies. These merchants purchase bulk quantities of natural stone material and in turn supply their own commercial customers. One of the best ways to firm up a relationship with a client is to offer them ways to maintain a floor surface once it has been installed. Homeowners likewise will turn to the merchant from whom they purchased their tiles when it comes time to perform cleaning and maintenance. Stonexchange offers top-quality cleaning and polishing products directly to our dealers and retail merchant clients, and these products are specifically formulated to work with the granite, marble, and travertine tiles we manufacture. Stonexchange does not purchase natural stone materials from an outside source. We are the manufacturer and importer of every product we sell. Whether the customer needs thousands of thresholds, window sills, or floor tiles for a commercial or residential development, our company is ready to fill the order. Our clients are located all across the nation. We ship full containers or full pallets of natural stone products via overland freight to construction sites, home improvement stores, and commercial installers. Our top-quality polishing and cleaning products are available to all merchants who carry our line of tiles and other natural stone materials. At Stonexchange, offering premium quality stone tiles, window sills, and thresholds is just a part of our business. Taking care of our existing customers is just as important. We want your tile floor, wall, or countertop to remain polished and in like-new condition for as long as you own your property. Contact Nalboor Tiles today and get a free quote on fantastic natural stone floor tiles as well as for the maintenance products that will keep them looking new for years. Remember, we specialize in product sales to merchants and installers, and we supply product year-round. Our specialty polishing and cleaning products are also available in bulk shipments, and we make them as affordable as our natural stone tiles.